In Episode 11 of our vChat series Eric Siebert and David Davis are joined by Doug Hazelman (@VMDoug on Twitter) of Veeam Software. 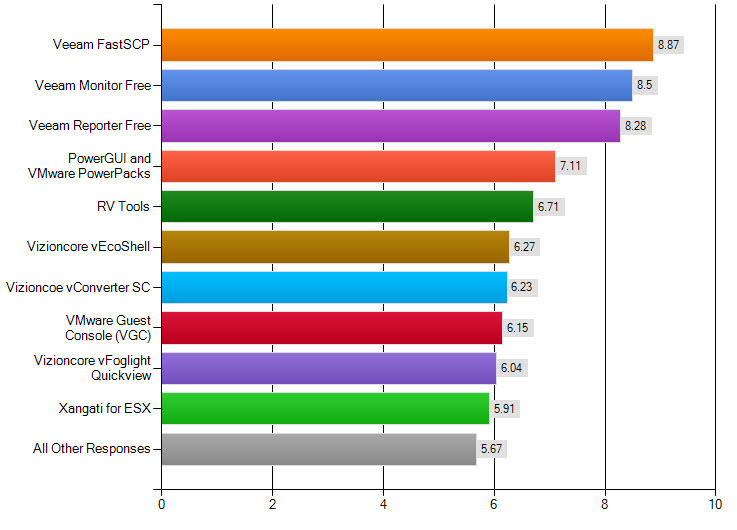 In this vChat, we announce the results of our top free vSphere Tools survey and answer viewer questions about vSphere. The full rankings of the free tools and tons of links related to viewer questions are found below the video (scroll down). Just prior to VMworld 2010 in San Francisco (on August 26 to be exact) I posted a Top Free vSphere Tools Survey. Kendrick Coleman and I spoke to over 2000 people at both VMworld SF and Copenhagen about the best free vSphere tools and, in those sessions, we asked attendees to make their opinions heard by voting on what THEY thought were the best free tools in this survey. Answer to question I asked Doug – difference between various Veeam Reporter versions and which include PowerShell – Veeam Monitor Comparison Matrix. Also note that Veeam Monitor and FastSCP do not offer PowerShell but Veeam Backup/Replication and Reporter DO. Also, I want to thank all the companies and individuals that take time to release free tools! Thanks for all the shout outs! free tools FTW! Typo: Vizioncore is shown as Vizioncoe. Otherwise, great list and very useful. The typo is fixed – thanks & thanks for watching!